Over the past decade, the migration of literary discussion to the internet has erased many of the distinctions between traditional criticism and what used to be thought of as “book blogging.” Many of the early bloggers now do a great deal of their writing for established print publications like Bookforum and The Times Literary Supplement, while most, if not all, of the traditional print venues for criticism have a significant online presence—that is, if they haven’t moved online entirely. The end result is a compromise; book bloggers have achieved a wider platform for their work, and the mainstream publications receive a much-needed injection of energy. What’s been lost, however, as most of the leading book bloggers have transferred their attention to more traditional venues, is the sense of blog writing as an independent form: the discursive, personal potential that once seemed like such a refreshing contrast to the mainstream. Now that the mainstream has been duly re-invigorated, blogs seem significantly less necessary: a container for overflow ideas, an intermittent intellectual diary, or else a form of writerly PR, a series of advertisements for oneself. 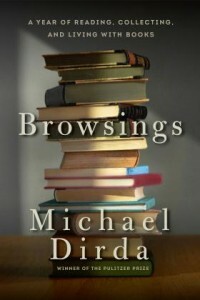 Which is why the case of Michael Dirda’s new book, Browsings, is so interesting. Having made his name writing for traditional publications like The Washington Post, Dirda has always championed a kind of erudite populism; his reading is omnivorous and extensive, with special attention given to what people used to call “pleasure reading”: detective fiction, sci-fi and fantasy, and the sort of hybrid work that occupies an uneasy position between popular writing and what is regrettably called “literary fiction”—a good example being Richard Hughes’ A High Wind in Jamaica, which Dirda references in Browsings. This combination of critical focus and catholic taste would seem to make Dirda a natural for the blog form, which is why in 2012 The American Scholar tapped him to write a weekly essay for their website – a year’s worth of which is now collected in this volume. In his introduction, Dirda refers to these posts as essays, but in their relative brevity (a few thousand words at most) and their personal, discursive nature, they seem more like posts from a particularly well-read book blogger: what Dirda calls “the meandering reflections of a literary sybarite.” Indeed, the range of topics displayed here is particularly impressive: Dirda’s travels in France (and exposure to French literature); his membership in the Baker Street Irregulars, a literary organization devoted to Sherlock Holmes; a loving and thoughtful analysis of what makes ReaderCon the greatest of all book conventions. Throughout, Dirda speaks to the reader with an appealing directness; he is alternately self-deprecating—“my trains of thought don’t precisely resemble the Acela skimming along to New York so much as the Little Engine That Could huffing and puffing up a steep incline”—and gloriously grumpy, as in his article concerning atrocious service at our national parks: “[n]aturally, the Center’s personnel regarded me as a pitiable crank and dismissed my outrage as obvious insanity.” His prose is the kind that produces appreciative snorts of laughter. It is sure to get you noticed in a coffee shop. In his introduction, Dirda suggests one read the essays in small batches, two or three at a time, and this seems sound, seeing as it mimics how one might experience the work on the web, casually crossing the American Scholar homepage, or finding these pieces at the end of a Twitter rabbit hole. Or, alternatively, one might think of these essays as similar to the shorter musings of noted literary wits like Max Beerbohm, another writer whom Dirda admires, and whom his prose is sometimes reminiscent of. But even when taken in small chunks, reading Browsings in full is not as satisfying as the substance of these bites might suggest. Some of this has to do with placing so many short essays in quick succession; there are more than a handful of essays concerning second-hand book buying that could have made a first-rate commercial memoir, if only they’d been combined. As it is, these essays hang together uncomfortably, and sometimes feel redundant: there are so many references to Dirda’s book-stacking habits that one wonders if he could write a book-length investigation into home storage. On the other hand, his attempt to tackle topics like the Aurora movie-theater shooting crams too much into a small frame; his call to arms for stricter gun control, “only the faces will differ, only the death counts will be new,” must have seemed impassioned, so close to the Aurora tragedy, but with some distance from the news cycle a reader asks for a slightly more nuanced response. Reading Browsings is an agreeable experience, and Michael Dirda’s voice is never less than diverting, but there are many moments in the text that call for permanent development. Halfway through the book, Dirda suggests a project which seems to me particularly interesting; “From time to time,” he tells the reader, “[I will] interrupt the usual personalia and literary musings… to present, instead, a little essay about some odd or forgotten volume that has caught my attention and deserves yours.” Unfortunately, he follows the description of this project with a regretful postscript: “I never really followed through on this threat or promise. But I have written, and continue to write, about neglected books quite frequently, and hope, some day, to collect some of these essays.” It’s difficult to resist the temptation to wonder about this shadow book, knowing what Dirda can do with a little more room to work. Ultimately, despite Dirda’s ample wit, there just isn’t enough in this collection, whether within single essays or over the whole book, to provide a fully satisfying reading experience. It may be that a reader expects something different from a book of essays, as opposed to a blog; a sense of thematic development, maybe, to reward their focused attention. Or else it might simply be a matter of a lapse in editing; perhaps presenting these essays more or less as they appeared on the web, in chronological order, does few favors to these “meandering reflections.” Either way, these essays are best received as an easy introduction to Dirda’s personal interests, and—in the new spirit of blogging—as advertisements for his other, better books. Sam Allingham’s first story collection, The Great American Songbook, is forthcoming in 2016 from A Strange Object. His essays and criticism have appeared in The Millions and Full Stop, and his fiction in Epoch, One Story, and American Short Fiction, among others. He lives in West Philadelphia. Find out more at www.samallingham.com or follow him on Twitter at @samsamallingham.